Flex-a-lite® 15-inch Black Magic Xtreme S-Blade reversible electric fans feature 3,300 cfm of airflow. Replacing a belt-driven fan with one of these powerful electric fans can recover engine power and increase fuel economy. 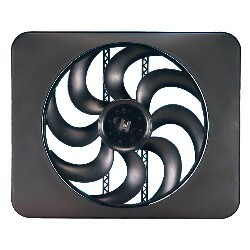 These fans feature a durable injection-molded shroud to draw air through 21 1/2x17 1/2 inch area. The S-Blade fan design with continuous outer ring provides quiet and efficient operation.